Lock in a great price for Hotel Almudaina – rated 8.8 by recent guests! Room was nice, and rooftop bar is amazing with great views of the bay. Great location and very friendly and helpful staff. Very convenient location and the breakfast was excellent! We had a wonderful long weekend in Hotel Almudaina! The staff is very kind and attentive and so good looking...... (especially the guys of the reception ;-)) are so charming and helpful). All very comfy: the superiorroom with balcony and gorgeous views, the spacious room with very big and comfortable bed and several cushions, the bathroom with nice thick towels, the waterstation for tea and coffee, having slippers for the room, very good wlan connection....... The breakfast was also very good, the eggs and more, the orangejuice, the wonderful coffee. We loved to have a late breakfast. Two girlfriends travelling together we felt really good and safe here. 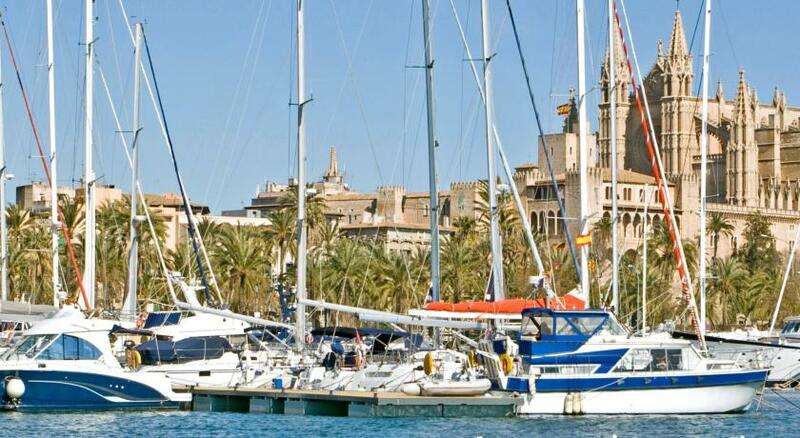 The area is more than perfect for a Palma weekend as it is right in the middle of all. 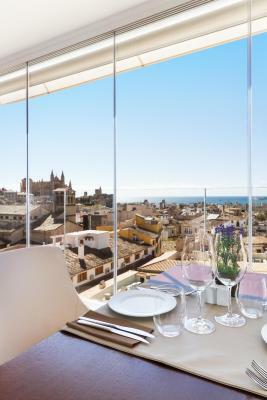 For the sundowner there is no better place than the skybar with the best views over the harbour and the cathedral. We definitely are coming back to Palma and to the Almudaina! Gorgeous comfortable bed. Spotlessly clean room. Appreciated the tea/coffee making facilities and full range of complimentary toiletries. Great location, on one of the main streets in the city center. Very close to Corte Ingles & other stores, nearby the restaurants & cafes area, 10-15 mins walk from the Cathedral & Almudaina. Friendly staff, I was offered a room upgrade at no additional cost (I booked a single room and they upgraded me to double room). Breakfast was included in the rate and provided plenty of choice. The room was clean, very spacious; wifi worked well. Watching the sunset from the bar at the top of the hotel - beautiful! Walking distance to everything you want to see, great hotels nearby. The bar on the top floor is fabulous!!! Hotel Almudaina This rating is a reflection of how the property compares to the industry standard when it comes to price, facilities and services available. It's based on a self-evaluation by the property. Use this rating to help choose your stay! 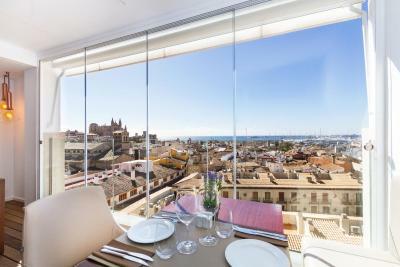 One of our top picks in Palma de Mallorca.Located in Palma de Mallorca's historic center, Almudaina has a large rooftop terrace with fantastic views of the city and port. Each spacious room has free WiFi and a flat-screen TV. Hotel Almudaina offers contemporary rooms with air conditioning and wooden floors. Some rooms feature a balcony with views of the bay and cathedral. A hot and cold buffet breakfast is served daily in the hotel's café. Many restaurants and bars can be found within a short walk. As the hotel is located on an island, the WiFi connection can become very slow sometimes. 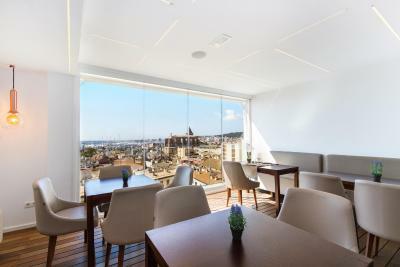 The hotel is located 1,650 feet from Palma de Mallorca's La Seu Cathedral. 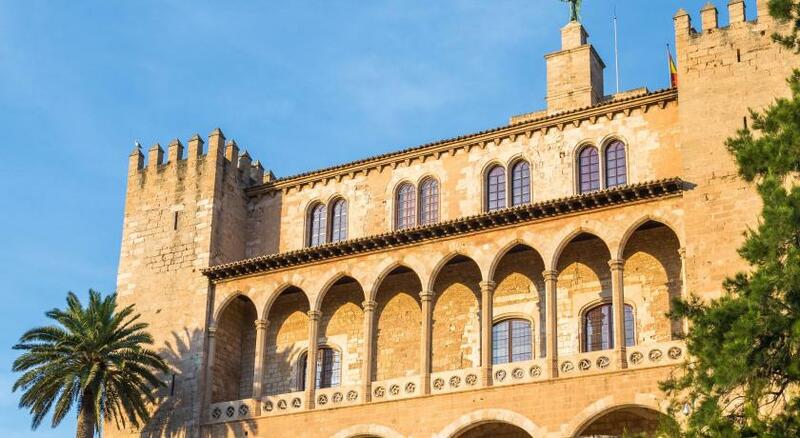 The Es Baluard Art Museum is less than 650 feet away and the hotel is just 5 minutes' walk from some of Mallorca's best shopping streets. When would you like to stay at Hotel Almudaina? This single room features air conditioning, satellite TV and a minibar. Almudaina Hotel is located on the most famous avenue in the centre of Palma de Mallorca, Jaime III. 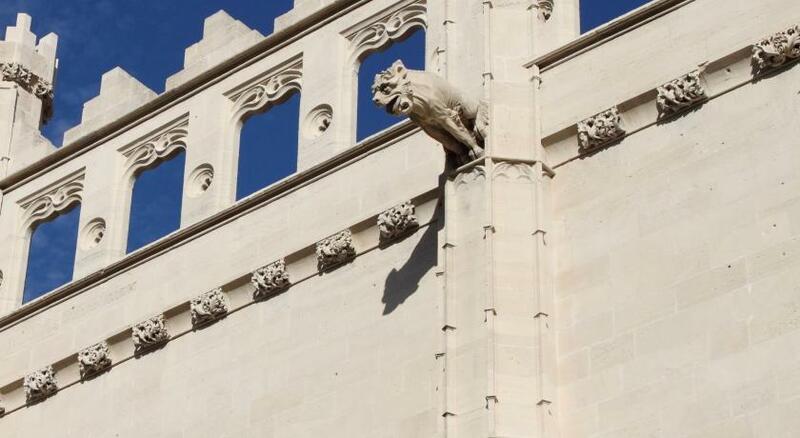 It is a privileged location to visit the historic town, The Cathedral and La Lonja. House Rules Hotel Almudaina takes special requests – add in the next step! Hotel Almudaina accepts these cards and reserves the right to temporarily hold an amount prior to arrival. As we were travelling in a group of colleagues, we were looking for a place that could accommodate all of us. With the 4-bed-rooms our needs were perfectly covered. Everything was great, breakfast was extraordinarily good and we really enjoyed the roof-top bar! Staff in Sky Bar not particularly friendly. Tried to get lunch on arrival day, only to be told no tables available and booking system in place. Should be pre-warned of this when booking. Air conditioning not working until May. Weather was very warm, so uncomfortable sleeping at night. Again should have been informed about this before booking. Selection at breakfast was very good, though unfortunately cooked choices not hot!! Cleanliness was excellent throughout the hotel. Reception staff friendly, welcoming and extremely helpful. Lovely room. Location of hotel very good. When taking a shower in the morning a whole load of mold came out of the ventilator. It sprayed down the wall, onto the toilette, floor and shower window. The housekeeping lady did not show empathy for the situation, the receptionist said he would certainly make some sort of refund when the hotel director turns up. Nothing to date. Rooms were basic. Breakfast was basic. No coffee available at breakfast from 10.35am -the waitress turned off the coffee machine at 10.35. Got coffee at McDonalds which was really nice just around the corner. Excellent location-next to all the shops. Very helpful at reception & very friendly. WiFi is terrible! Very weak signal and intermittent service. Guacamole was not fresh on the nachos that we had in the bar. Loved the sky bar and roof terrace. More tea bags, coffee and milk in room. Limited to one milk per person per night! Most reception staff good, one man quite abrupt..... on arrival just said ‘passports’. Improve instructions on how to access WiFi. Fabulous location and wonderful sky bar with very good food, great value for money too. Expensive for single person on own - London Price for a 4 Star! Some of the staff in the sky bar were rude and extremely unfriendly. The hotel was beautiful. The rooms were lovely, great location and of course the sky bar was amazing. 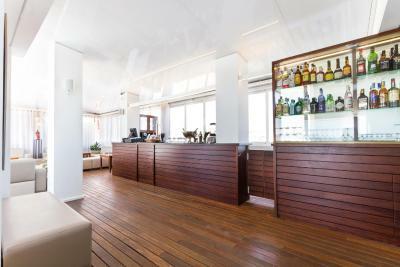 The reception staff were really helpful and we found some great bars and restaurants because of their assistance. We seemed to spend the whole time waiting for the lifts which may have something to do with the Sky bar being open to the public so it is in constant use maybe? Wasn't really a problem as it caused a laugh and a challenge, it was quicker to use the stairs up to the sixth floor for the younger ones! 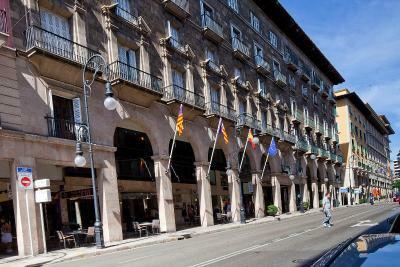 The hotel is right in the middle of Palma in walking distance of all the shops, tapas bars and the port. The breakfast is a help yourself and very varied and plentiful, we only waited a few minutes to get a table for a family of four so we could all sit together. English is spoken by all the staff so no language problems and they even ordered a minibus and numerous taxis instantly for us whilst we were there and all were fine and punctual. The Sky bar and restaurant on the top floor has spectacular views and the food was excellent although a bit pricey but the wine was cheap and good considering it is a restaurant where normally the price gets hiked up. Oh and the bedrooms and bathrooms were spacious and well equipped.